Glenn Matthew (1958-2014) started calling in 1977 at 18 years of age, and in less than a year had started making a name for himself and impressing not only square dancers but the general public as well; as shown by their numerous requests for his calling at demonstrations all over the Philadelphia/Delaware Valley region. In 1978, the Single Square Dancers USA made their first two presentations of the Yellow-Rock Scholarship - one went to Glenn. He used the money to attend Caller's School and was taken under the wings of Al Brundage and Earl Johnston, receiving extra attention and assignments to showcase his youthful energies and ambitions. Glenn called at several Nationals (NSDC), Canadian Nationals (starting at the 2nd Convention in 1980), Delaware Valley Conventions, and traveled internationally. 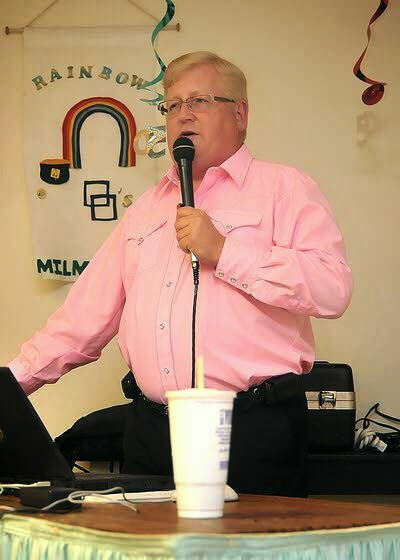 Glenn was the first caller for Dixie Derbys: founded in 1980, with membership over 375, averaging 23 squares at dances; and stayed for 21 years. He and his dancers have been written up in numerous newspaper articles, with and without pictures, and touted the world of square and round dancing's virtues and its "family" values. Glenn and his dancers participated in many area parades, including the Gimbles' Thanksgiving Parade in 1985, and were the first square dance group to win a fifth place prize as part of the Philip J. Hammond New Years' Association at the 1985 Mummers' Parade in Philadelphia. Glenn was always smiling, friendly and lending a helping hand when possible, and worked hard at his trade - even impressing other International Callers with his quiet knowledge and quick abilities when tested in play. He was a recording artist with several record companies over his three decades of calling. Glenn left behind his father, an older brother, nephew and niece; and an enormous family in the square and round dancer world -- he is sadly missed. By: father, Russell T Matthew, Jr., with help of cueing "older sister", Jane M Styer Glenn David Matthew passed away on Tuesday, November 11, 2014 in Christiana Hospital, Delaware. He was 55. Born in Philadelphia, and formerly of Hulmeville, Glenn had resided in Bear, Delaware.